When 12-year-old Sady was left at an orphanage a decade ago in the slow-paced riverside city of Battambang in western Cambodia, it was not because her parents had died; it was because they were poor. At that time around half of Cambodia’s population lived below the poverty line. Although the proportion has more than halved since, 3 million people still live in poverty. Unable to take care of their nine children, Sady’s parents believed putting her and her younger brother in an orphanage would allow them to attend school and attain a better life. It is a common misconception in Cambodia. “I remember having this conversation sitting outside with my dad, and him saying: ‘Try to study. I don’t have anything to give you except bringing you here – that is my only gift’,” Sady says, her eyes filling with tears. The orphanage became her home for two years. Sorita, 18, is a student at Department of Media and Communication of Royal University of Phnom Penh in Cambodia. She’s also a blogger with the global Voice of Youth. 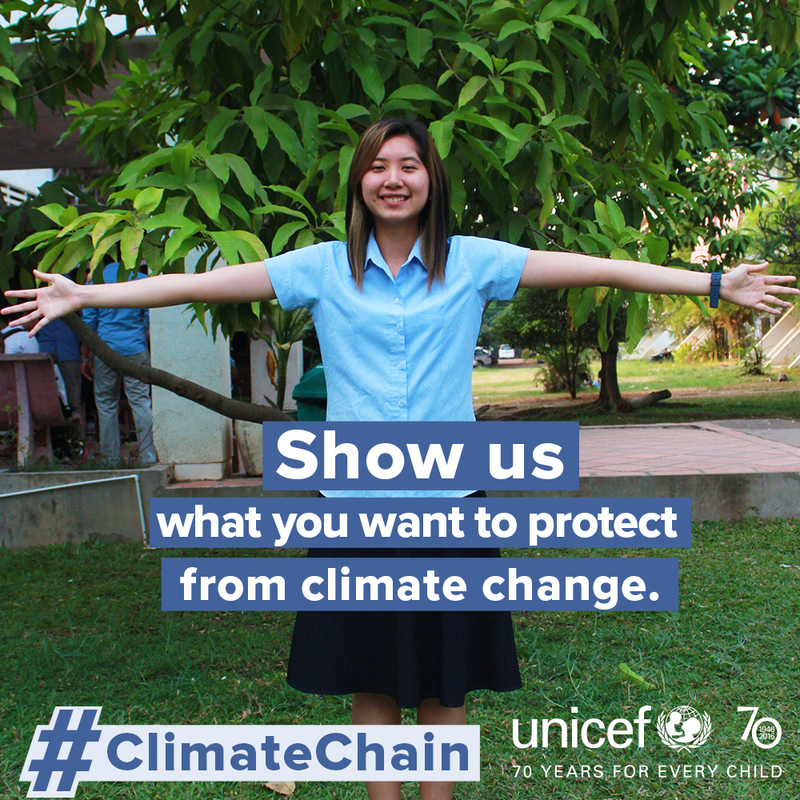 On the occasion of #WorldWaterDay and UNICEF’s global campaign #ClimateChain, we are featuring a blog written by Sorita about how she sees climate change. 1. You are a farmer in Cambodia. Your province has just been hit with a massive flood. Your rice paddy is completely destroyed. Your daughter keeps having diarrhea. She's pale and her lips are cracked. The road is too flooded for you to take her to the hospital. Knee-high water lulls around the house. It's starting to stink. Kem Sokkem wakes up every day at 4 a.m. from his hammock next to a stack of empty water bottles. He’s been sleeping inside the water treatment facility in his village for over a year now. It’s not that he’s homeless. Kem’s house is just a few minutes away. But living at the water treatment facility has become a routine. “If I sleep here, I can start work right away and make sure nothing gets stolen,” says the twenty-two-year-old. Starting the day at 4 o’clock in the morning is not easy, but Kem is committed. Plus, he has a clear goal: to deliver 21 twenty-litre bottles to two nearby primary schools by 7 a.m. After that, he has about another 50 bottles to deliver around his community in Voa Sar commune. Access to safe water and sanitation is a basic human right and is vital for every child’s survival and healthy growth. On the occasion of World Water Day celebrated every year on 22 March, we share with you stories of how community members in Cambodia are working hard to make sure that children and their families have access to safe water. 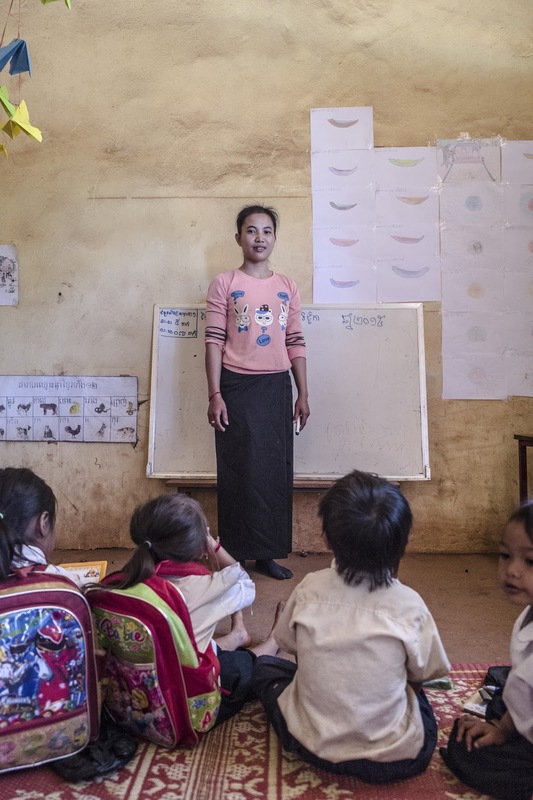 Prasat Sanlong primary school is located in rural Thnal village, down a bumpy, dirt road about 15 kilometres from the small town of Sautr Nikum. The school has existed since the 1960s and re-opened after the Khmer Rouge period in 1979 with a small shelter built by the community. One of the students of that school was Mr. Suk Sou, now 61 years old and president of the school support committee (SSC). The SSC is a community volunteer group consisting of elders, respected people and local leaders whose job is to mobilize resources, such as contributions from parents and the community, to support the school. “When I was a child studying in this primary school, there was only a small school building and no water or toilet facilities at all. I never had chance to wash my hands, use the toilet or drink water at school. I did not want my children to face the same difficulties.” Mr. Sou said. In light of International Women’s day we’re celebrating this entire week by shining the spotlight on Cambodian women who work tirelessly to improve the lives of children in the country. 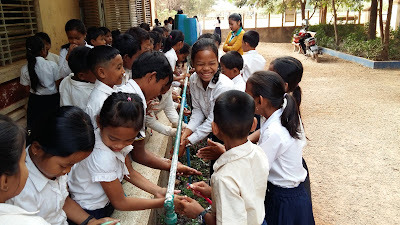 Dok Sophallida has been serving as the School Director of Vealtrea primary school in Battambang province for about five months now. She says that education is her passion, especially for children with disabilities. Ms. Sophallida started out as a teacher and had received training on inclusive education, which aims to equip education professionals with the knowledge and skills necessary to creating an inclusive school environment for all children, including those with special needs. On the occasion of International Women’s Day celebrated every year on 8 March, I spoke with one inspiring Cambodian woman, Ms. Map Somaya, who has dedicated a significant part of her life to serving some of the most vulnerable children in Cambodia. Now in her 60s, Somaya has been working for 20 years with Mith Samlanh, a local organization serving marginalized children and young people, as well as their families and communities. Ms. Somaya, mostly known by her nickname Didi, is the Programme Director at Mith Samlanh. She exudes an air of charisma, confidence and a burst of positive energy. As a child, Ms. Somaya grew up in a supportive, yet conservative family. But she was a curious child who didn’t hesitate to ask challenging questions. “I loved to be free when I was a child and I liked to play whatever I saw other children my age could play.” she said. Ms. Somaya and her family, like many others in Cambodia, were deeply affected during the brutal era under the Khmer Rouge regime. Ms. Somaya lost her father, her two brothers and her husband due to the conflict. By the end of the war, she was a single mother to one son. At age 20, she was responsible for taking care of her entire family. This left her very exhausted both physically and mentally. But the difficult circumstances didn’t break her or knock her down. Her son and her surviving family members gave her motivation to carry on. She says that her mother was the one person who taught her to work hard and be persistent. Determined. Resilient. Fearless. These are only a few of the qualities to describe Ms. Phalla Neang. School director and country-wide coordinator for the ‘Education for Blind’ programme at local non-governmental organization Krousar Thmey. In celebration of International Women’s day, we are highlighting the work of inspirational women in Cambodia such as Ms. Neang. With a professional career that expands for over 20 years, she is a pioneer in the field of education for children with disabilities and a powerful advocate and ally to many of her students. All is quiet in the grounds of the community preschool in LA Ak village, Ratanak Kiri province. A hen pecks at the red earth as her seven chicks skitter anxiously behind her. A couple of pigs snuffle in the bushes, looking for a morsel. This is rural Ratanak Kiri – Cambodia’s most remote province in the far north east of the country. Many families here rely on farming, and it’s normal for children to help their parents in the fields, sometimes to the detriment of their education. 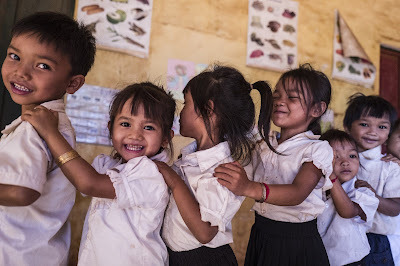 Today though, preschool teacher Chey Nita has a classroom full of enthusiastic youngsters. Early childhood is the most significant time for children’s development. That’s why preschools are so important, giving children vital learning and development opportunities in their early years. Preschool attendance also means children are more likely to start primary school at the right age and to do well once they get there. Nita, 21, has seen firsthand the difference that early education makes, both for her students and her family.